You can use Articulate Storyline to create eLearning lessons that are accessible to users who have visual, hearing, mobility, or other types of disabilities. Published Storyline lessons can be read by a screen reader. Screen readers are programs that use auditory feedback to read screen information to a learner. In addition, the screen reader acts as a mouse pointer, providing navigation via keyboard commands. The most widely used screen readers are separate commercial products: JAWS from Freedom Scientific, Window-Eyes from GW Micro, Dolphin Supernova by Dolphin, System Access from Serotek, and ZoomText Magnifier/Reader from AiSquared are prominent examples in the English-speaking market. The open source screen reader NVDA is gaining popularity. 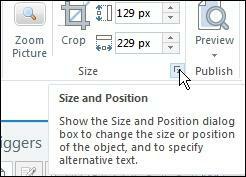 With an image selected, go to the far right of the Ribbon's Format tab and click the menu to the right of Size. From the left of the dialog box, select Alt Text and, in the Alternate text field, type the text you want read aloud to the learner. And that's it. When an assistive device comes across an object with Alternative Text, the assistive device will read the text aloud for the learner. Looking for instructor-led training on Articulate Studio or Storyline? Check out these live, online classes.